I’m pretty lucky – I don’t need to commute, because I work from home. (Or, it sometimes seems more accurate to say, I live at my work). My husband refuses to cycle to work because a) the route back is one mega hill, b) his bike is more unreliable than our car, and more importantly, c) he always has boxes of paperwork and a laptop to transport. So neither of us have much experience of commuting by bike. But, I know for some people it’s a tipping point for buying a bike, and in many cases, it can actually be faster to get to where you’re going by bike. But, is it cheaper? 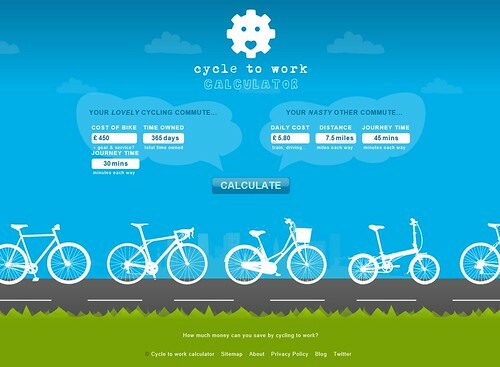 There’s a handy website at http://www.cycletoworkcalculator.com/ which could help you work out how much money you can save by travelling to work by bike. It’s not perfect (and requires you to do some of the maths yourself in order work out how much your present commute costs per day), but it’s a good start to incentivizing people to cycle to work. With petrol prices going up all the time, it certainly something to consider. I wonder, though, how many people cycle to work because they just like cycling? Shouldn’t that be your main reason? All of the cost and health benefits are really a bonus – and sort of pointless if you actually don’t enjoy the commute. Cycling is something you should do because it’s awesome, not because it’s ‘cheaper’. And, I really do wonder how much cheaper it really is – honestly, starting cycling from scratch, with a brand new bike and all the equipment, is not cheap. Yes, it pays off over time, but a bike isn’t a financial investment – it’s freedom on two wheels. Can I get a hells yeah? But, of course, as the Cycle to Work Calculator site itself is the first to point out, sites like these are great for making you feel smug about your bike-bound commute. Saving the planet… yeah, cool. Looking stylish… great. Sailing past traffic… ha. SAVING THE MONEYS… AWESOME! May I get another hells yeah?